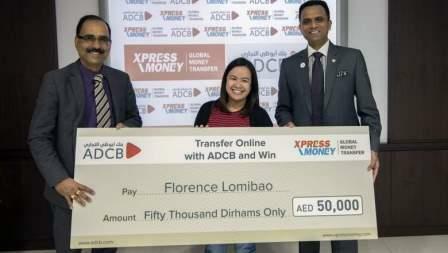 When Florence Lomibao sent money home from her ADCB online banking app through Xpress Money, she could never imagine in her wildest dreams that it would win her Dh50,000. The Filipina nurse in Al Ain is overjoyed with the cash prize she has bagged under a promotion scheme and wants to invest it to complete her under-construction house in Pangasinan, the Philippines, reports The Filipino Times. An elated Florence was quoted as saying in the report: "At first, I just couldn't believe that I have won Dh50,000. Everybody has been asking me about what I'm going to do with the money. With this money, I can finish the construction of my dream home in the next 45 days; and with whatever remains, I would like to start a small business in the Philippines - maybe a food cart or something. "Right now, I'm just too excited. I have been using Xpress Money to send money since I moved to the UAE and when I found out that the service was available through ADCB online banking, it became the obvious choice as I already had an ADCB account." It was around two-and-a-half-years back that Florence landed in the UAE, after getting a job in a hospital in Al Ain. Last year, her dream house started taking shape, and she has been sending half of her salary back to her country. Her family consists of five. While two members of her family are also OFWs, two of her siblings live in the Philippines along with her parents, the report adds. Florence's prize has undoubtedly come with a stroke of luck, but she had the courage to nurture a dream. And the dream has paid off!